Thanks for taking the time to read first. How can I fix it? Please help me to overcome the problem, thanks (bow). After I made compose down and set the port 1883 open (as “sudo ufw allow 1883/tcp”), I still got the same error message. BTW, I’ve tried different way to install the Mosquitto MQTT Broker before the Docker, Is this step leading the Farmbot Web App Server to confusion? or should I post my ENV file for this problem? On the other hand, I’ve experienced similar problems as “7.0.2-beta and AMQP connection timeouts” in March. After I reinstall the Ubuntu and update the file to the newest version, the problem became the title. Is there any relationship between the two problems? On the other hand, I’ve experienced similar problems as “7.0.2-beta and AMQP connection timeouts” in March. Hi @AstrayAA, that AMQP issue was fixed in the 7.0.2-beta FBOS released on commit 205542d0 at around April-4. I notice that the 7.0.2 release is now available. 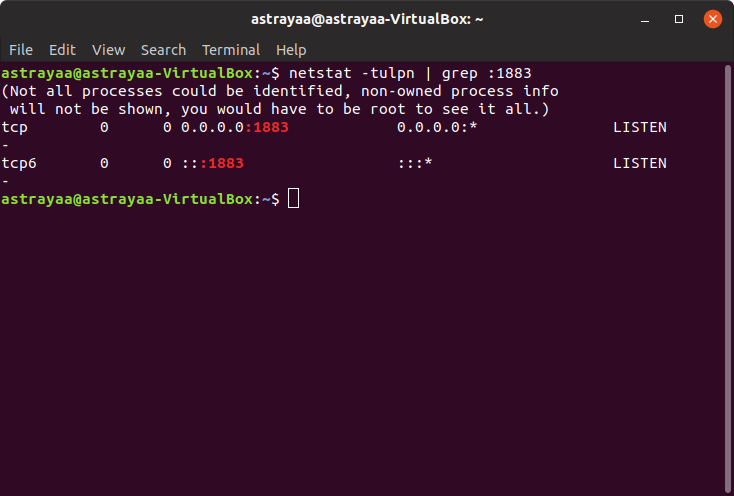 @AstrayAA, you could try sudo netstat -nap and look for the Linux pid using that port already. It seems not being used for another software. 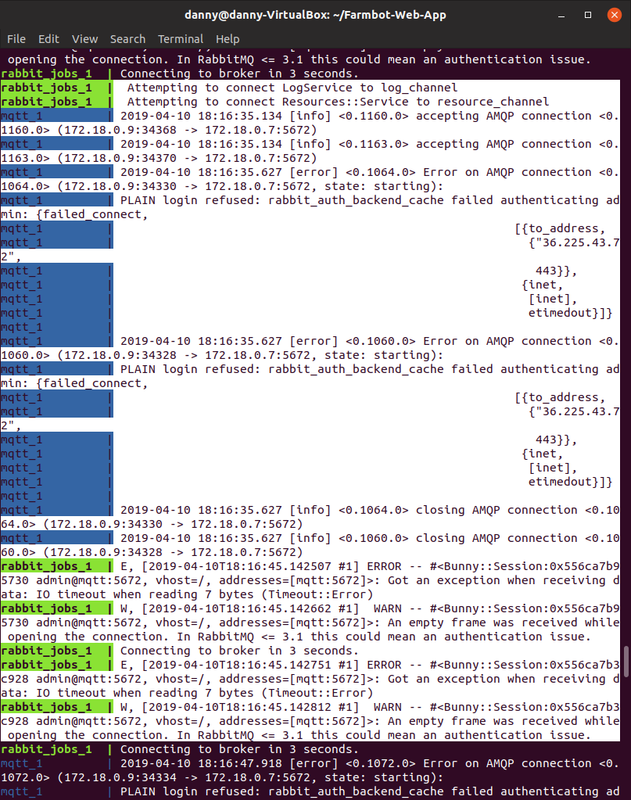 Should I read all line-to-line informations from “sudo netstat -nap” ? Or I can use specific order to check? Thanks. BTW again, why I mention the problem about “AMQP connection timeouts” is: after the problem fixed and I update the Web-App as I thought, the MQTT problem begin to show and can not solve. @AstrayAA If you installed mosquitto, it was most likely added as a system service and is running in the background on every boot (and also using port 1883). I ran the setup instructions for the latest version (released Friday, April 5th 2019) and did not hit any issues with MQTT ports, so my hunch is that there is a local configuration problem at play. I will re-run the installer again just to be sure though. Also, what do you see when you run git log -1? 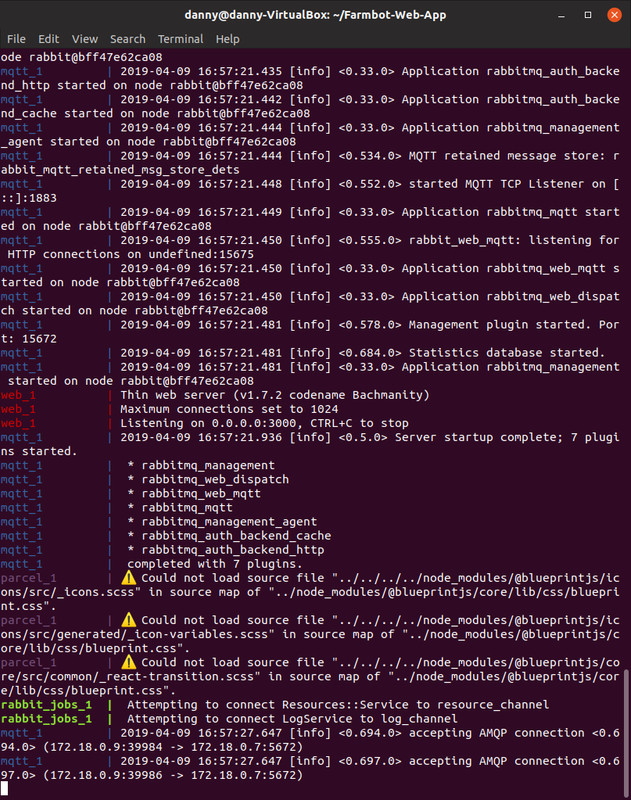 I install Mosquitto MQTT Broker before Docker and let the installation step as the ubuntu_example.sh said. After I re-install all the system, I try the minimum way to follow the step for build the server. It seems the change will let the 1883 port in use, I’m not sure why. BTW, because my system now is in the simplest state without all software (only firefox and Frambot Web App), what I type “netstat” would not show any information for me. I also disable firewall (by default, it would not enable until you manual on it). It looks like the “sudo docker-compose up” command fail to connect service. I’m not sure why, I’ll try to read more post and fix it. You are seeing this error because you are not in the project. git commands must be run from the project directory. looks like the “sudo docker-compose up” command fail to connect service. You should wait a while (sometimes as long as 3 minutes on older machines) for asset compilation to finish. parcel_1       | ✨  Built in 58.14s. In the screenshot above, I do not see any problematic error messages, so you most likely need to wait for compilation to finish. After that, you should see the app at http://localhost:3000. @RickCarlino `Thank you for your patient response. rabbit_jobs_1 | Connecting to broker in 3 seconds. to connect the web pages. Should I bring the hardware of Farmbot on before the command of compose -up? BTW, this problem happens on VM or real PC. Do you mean to say that you closed the terminal after running setup? The terminal must stay open for the server to work. You cannot close it. If you don’t like having the window open, you can run sudo docker-compose up -d instead. This will run the server in the background. this problem happens on VM or real PC. This morning I set up a virtual machine and ran the instructions from ubuntu_example.sh. The server ran fine, so my guess at this point is that there is an issue with your local network.